← Which one do you think God wants you to be? Why is approval so important? Those who keep score in life want to know that they count. But when you work for an audience of one you always know that you count. I assure myself it’s not. That I don’t want the compliments, affirmation of others. I saw people standing in metaphorical jail cells the doors are open there were no locks, no key. Yet the people inside were clinging to the bars- desperately afraid to come out- because captivity was all they had ever known. Wait a minute was that me? I can identify with the feelings of insecurity Rebecca goes on to describe. Second-guessing myself after teaching a men’s bible study, keeping score of the likes on my Facebook posts, hits on my blog. When the numbers are good I’m up when they aren’t, I’m down. Was it good enough, did it measure up, why not? It’s like Junior High all over again. My writing, my teaching is focused on encouraging, offering hope to those who are discouraged, struggling, in difficult situations. I know my gifts, I know my calling but here’s the thing. I can operate in those gifts, go forward with the calling, but still not be free to live what I encourage others to embrace. And if I’m not careful I will fall into competing, comparing, copying and eventually burn out. Because when I allow those things to drive my desire for approval it will never be enough. This morning I went for my yearly doctor’s visit. The nurse whom I have gotten to know over the years, did the usual medical procedures, and then began to tell me how she prayed for me, that I often came across her mind. As I listened, she began to speak to situations in my life that I had not shared with her, that she could not have known about. All of the approval I could ever seek and desire from other people will never be enough. We live in a time when people are desperate for approval. We want to know we matter. We have bought the lie that even though we are God’s creation, we’re not good enough, that at the end of it all we really don’t matter. I don’t know where you are today. I don’t know what it might be you are struggling with. Maybe you have listened to the lies and in a desperate quest for approval always come up short. Maybe you’ve been hurt by those who matter most to you. Maybe even in your success the desire for approval overshadows everything you have accomplished. There is an audience of One who is your biggest fan. The One who loves and cares for you more than you could ever imagine. The One to whom you matter so much that He came and died in your place, for your sins. And when all is said and done that audience of One is enough. 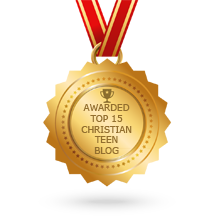 This entry was posted in A CLICK A BLESSING TODAY, Christian Teens Blog JF, CHRISTIAN TEENS BLOGS, Christian Teens Blogs - He is my Peace, Christian Teens Blogs - He is my Peace, Light and Refuge, SHARING STRUGGLES, TAPESTRY TREASURES and tagged approval, confidence, One. Bookmark the permalink.